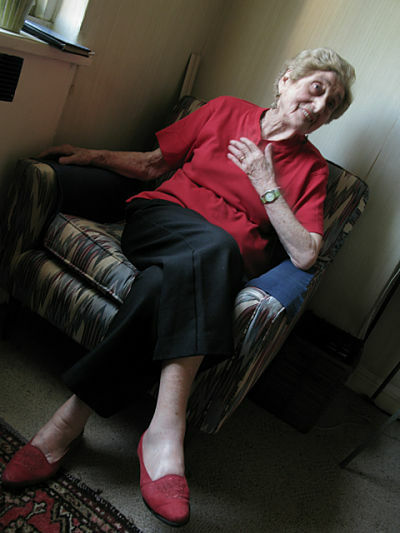 Herta Bloch — who we wrote about in our last post HERE — knew practically everyone in the German-Jewish community of Washington Heights in NYC between the 1940s through the mid-1990s, because during those years so many people shopped at Bloch & Falk, the store she owned with her husband Alfred. 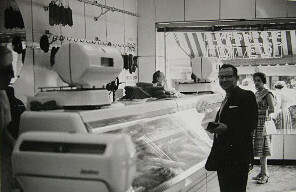 They came to buy the German-style cold cuts and sausages (Aufschnitt and Wurst) that were made exclusively of beef or veal (as opposed to the de rigueur pork of most German meat products). All of their products were made and smoked on-site in the back room: kosher salami, ring sausage, pastrami, smoked tongue, corned beef, the ubiquitous cervelat (a hard salami) and many other assorted meats. My grandparents, as well as most of their friends and family, shopped at Bloch & Falk. 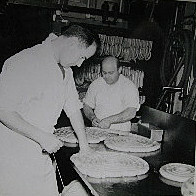 After Oma and Opa moved to New Jersey in the 1950s, they continued to make the short journey back over the Hudson River to shop at Bloch & Falk on a regular basis for the provisions they ate on a daily basis. The store was on Broadway and 173rd Street and was an easy stop en route to or from New Jersey via the George Washington Bridge. I don’t think their refrigerator was often without a stash of cured meats wrapped in white, waxy butcher’s paper. After Opa died, my uncle Andy would often stop in there to shop for Oma, until the store went out of business in the 1990s. Today the type of food Bloch & Falk produced has almost completely disappeared. 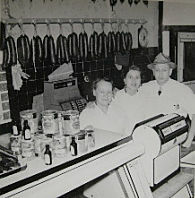 Sausages and cold cuts with that unique blend of both German and Jewish qualities barely exist anymore — and if so, probably not with the superior quality of B&F, where everything was made by hand, in-house and in small batches. We were surprised to discover, quite by accident, a beef ring sausage for sale at the Kleinmarkthalle in Frankfurt (a large, indoor market with many stalls of food purveyors) in 2011. My mother spotted it first: Rindwurst (beef sausage) written in blue writing on a package in the glass case of a meat vendor we were walking past. 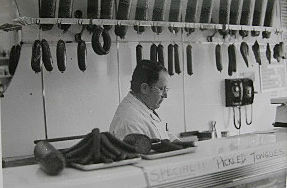 Since it is unusual to see beef, instead of the usual pork, sausages in Germany, she inquired of the purveyor and learned that the company — Gref Völsings, a local sausage company in Frankfurt that has been in business since 1894 — originally made these sausages specifically for their Jewish customers starting about 100 years ago, and has continued making them ever since. My mom bought a vacuum sealed package of the Rindwurst to bring home to Boston. There, she made the same traditional lentil soup that both her mother and grandmother made when she was a kid, using the smoked Ringwurst from Bloch & Falk to impart a smoky, meaty flavor to the soup. To her great surprise, she said it tasted very, very much the same as the Ringwurst from her childhood! People who remember the store and their products still lament the loss of Bloch & Falk. To this day, people write comments on blogs and internet chat rooms about their Wurst and Aufschnitt in yearning tones. Herta shrugs off the suggestion that someone, somewhere might make a similar product. “Ah, it would be much too expensive to do it the way Alfred made it. And besides, no one knows how to do it.” Yet, Herta perhaps isn’t fully aware of the growing artisanal food movement, one where people are willing to seek out — and spend more — for quality, hand-made products. Perhaps this is the type of product that would allow two seemingly distant food worlds — one of Old World traditions and the other of modern tastes rediscovering those same Old World traditions, to successfully meet up. We wonder: would there be a market today for these types of sausages and cold cuts that have all but become extinct? What are your thoughts? We would like to hear from you!